Bradford’s Skipp Miller was the overall individual champion on Saturday in the Cross County Conference cross country meet at Tri-Village. Miller’s winning time was 20:27.14. Miller along with Karmen Knepp in second place and Austy Miller in third place helped lead the Railroaders to the girls team championship as well. 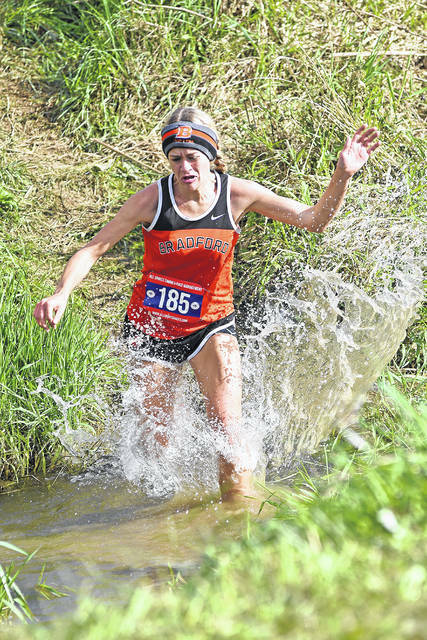 Bradford’s Karmen Knepp finished in second place on Saturday helping to lead the Railroaders to the girls team championship in the Cross County Conference cross country meet at Tri-Village. 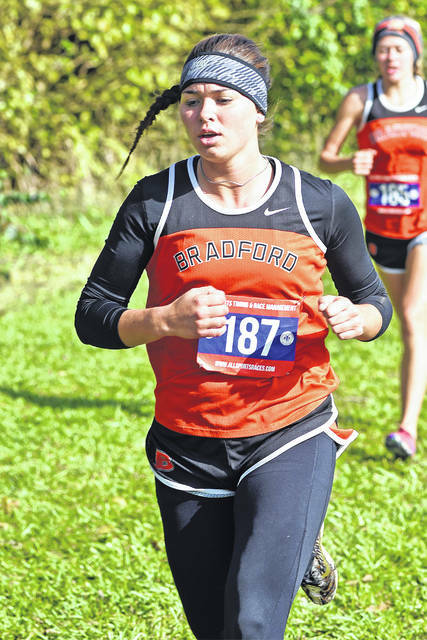 Bradford’s Austy Miller finished in third place on Saturday helping to lead the Railroaders to the girls team championship in the Cross County Conference cross country meet at Tri-Village. 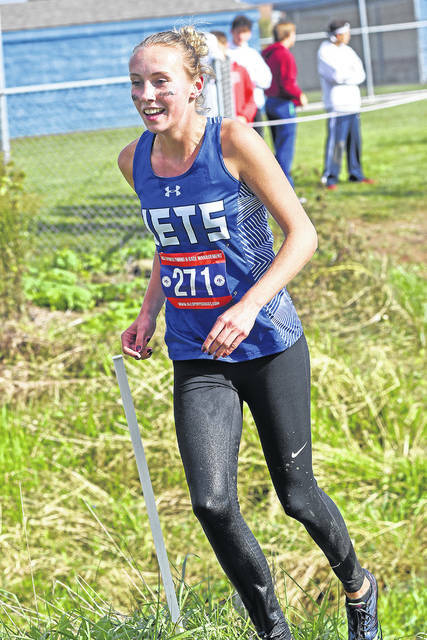 Franklin-Monroe’s Selene Weaver finished in 10th place on Saturday in the Cross County Conference cross country meet at Tri-Village. 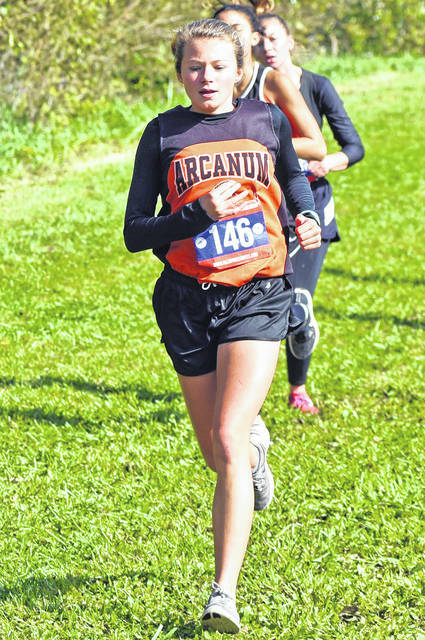 Arcanum’s Lydia Shannon finished in 7th place on Saturday in the Cross County Conference cross country meet at Tri-Village. 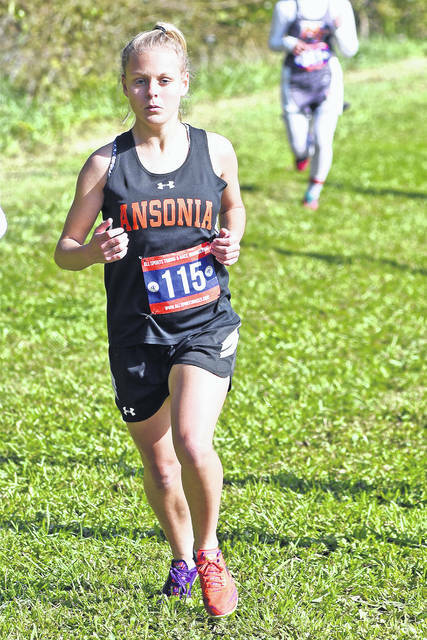 Ansonia’s Lydia Snyder finished in 16th place on Saturday in the Cross County Conference cross country meet at Tri-Village. 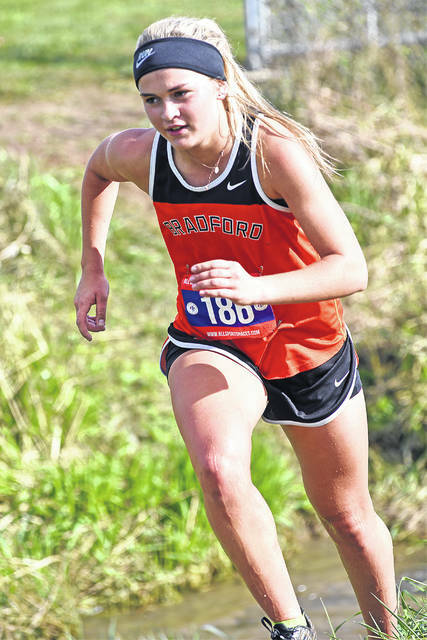 NEW MADISON – The Bradford girls cross country team captured the top three individual spots to help them win the team title in the Cross County Conference league meet on Saturday at Tri-Village. The Railroaders totaled 32 points to claim the championship. Skipp Miller was the overall top runner with a time of 20 minutes, 27.14 seconds. Karmen Knepp was runner-up in 20:36.96 and Austy Miller came in 3rd place in 20:46.28. Bradford also had two other runners place in the top 30 with Olivia Daughtery (22:36.58) in 9th place and Mercedes Smith (23:24.13) in 17th place and just missing the top 30 was Jenna Shellabarger (25:17.89) in 31st place. Ansonia finished in 4th place with 115 points as a team and had five runners in the top 30. Lydia Snyder led the way in 16th place with a time of 23:21.61 followed by Mariah Troutwine (23:30.9) in 18th, Olivia Wright (24;27.61) in 25th, Emily Wright (24:31.99) in 27th and Cierra Rosinski (24:42.8) in 29th. Kierra Reichert (26:03.07) was 35th and Deanna Moody (30:12.81) was 43rd. Arcanum totaled 120 points to finish 6th as a team with Lydia Shannon finishing 7th overall with a time of 22:00.19. Aidan O’Brien (23:47.82) was 21st,, Elora Sudduth (23;59.57) came in 22ndplace followed by Regan Weaver (25:29.93) in 32nd place, Chloe Eberhard (26:23.04) in 38th place, Melanie Kutter (26:25.86) in 40th place and Makenna Gunckel (33;21.38) in 48th place. Franklin Monroe, Mississinawa Valley and Tri-Village competed in the league meet, but didn’t have enough runners to compete in the team competition. For Franklin-Monroe, Selene Weaver finished 10th overall as an individual with a time of 22:10.66. Nicole Brocious (24:04.8) placed 26th.followed by Raegan Warner (25:17.7) in 37th place and Kim Fourman (46:39.1) in 68th place. For Tri-Village, Lissa Siler completed the race in 35th place with a time of 24:51.2. Also for the Patriots, Samantha Combs (27:11.5) came in 53rd place, Meredith Butsch (29:56.5) placed 56th overall and Emma Printz (30:15.4) finished in 58th place. For Mississinawa Valley, Noemi Arrona (27:03.6) finished in 51st place followed by Madison Hayes (34:26.6) in 66th place and Gabby Rammel (34:55.3) in 67th place. This entry was tagged Ansonia, Arcanum, Bradford, CCC, Franklin Monroe, Mississinawa Valley, Skipp Miller, Tri-Village. Bookmark the permalink.